Though World War Z borrows little more than its title and its realism-driven approach from Brooks’ innovative novel, it remains an entertaining, suspenseful, and unique film in its own right. Gerry Lane (Pitt) is a former U.N. investigator who now spends his days as the perfect pancake-flipping family man, living with his wife (Mireille Enos) and two daughters in a suburb of Philadelphia, almost oblivious to the viral outbreak that pervades the daily news. From his Trader Joe’s-stocked pantry to the safe Volvo station wagon, Gerry’s life is a 21st century version of the suburban Eisenhower-era ideal… until the spreading disease hits the City of Brotherly Life. Both a good dad and a resourceful investigator, Gerry picks up the Subway Sam doll that his daughter dropped during a panicked escape… and uses the doll’s second-counting mechanism to time how fast a victim regenerates once bitten by a zombie. Once he gets his family secured with the U.S. Navy (it helps to have friends in high places), Gerry is called back into action to help track, contain, and eliminate the plague. 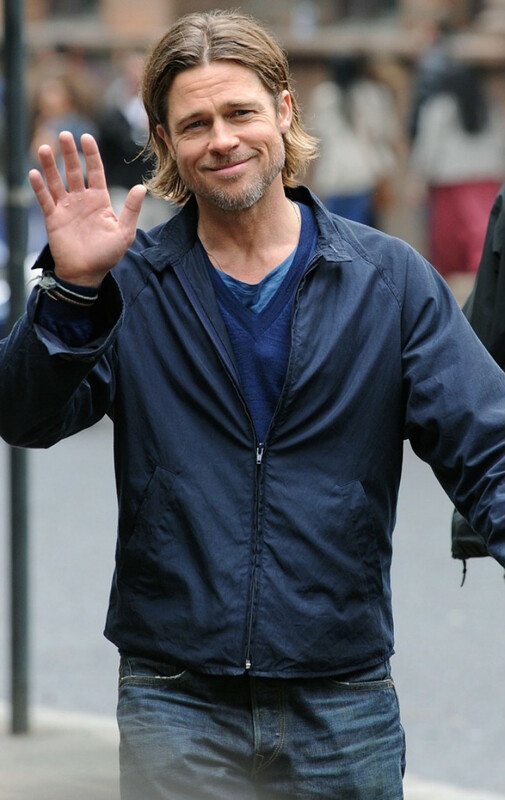 The affable Brad Pitt waves to a photographer on the Glasgow set of World War Z. Many set shots like this show more details of the actual jacket and outfit than are clearly seen in the fast-moving, and often dark, action on screen. 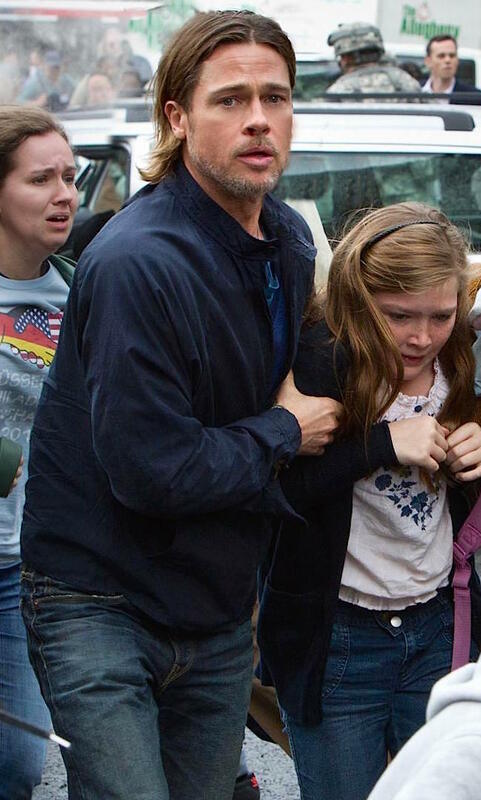 Gerry Lane begins World War Z in a very accessible everyday casual ensemble of a zip-up jacket, layered v-neck sweater and T-shirt, and comfortable jeans, all in blue. While the rest of his family is outfitted in more colorful clothing than the monochromatic Gerry, his outfit represents Rubeo’s goal as his layers get increasingly bolder and brighter as they get closer to the skin. Gerry’s outer layer is a Harrington-inspired jacket in a navy lightweight waxed cotton, or possibly a cotton/nylon blend. It has the standing collar of a traditional Harrington jacket but it fastens around the neck with only one button rather than the usual two. The jacket has slanted hand pockets with no flaps, raglan sleeves, and pointed tabs on the cuffs designed to button through one of two buttons to adjust the fit over the wrists. Several brands offer their own replicas of this specific jacket, though of questionable quality. The quintessential Harrington jacket remains the Baracuta G9, though budget-minded shoppers may be interested in the similar jacket from ASOS with a price tag of less than $60. If you want something closer to Pitt’s jacket with the single-button throat latch and buttoning cuffs, you could check out ROYALE Filmwear’s take on the Tom Ford jacket made for Daniel Craig in Quantum of Solace. One last moment of family bliss. Gerry’s marine blue V-neck sweater from Banana Republic is more representative of his life as an affable suburban dad than as a badass zombie-fighter. When the sweater was auctioned and sold for £732 by Prop Store last year, the material was described as “a silk, cotton, and cashmere blend,” a signature fabric blend that is still part of Banana Republic’s knitwear lineup five years later, though not in the bold blue tone worn by Gerry. The neck line, cuffs, and waist hem are narrowly ribbed for a trimmer fit. 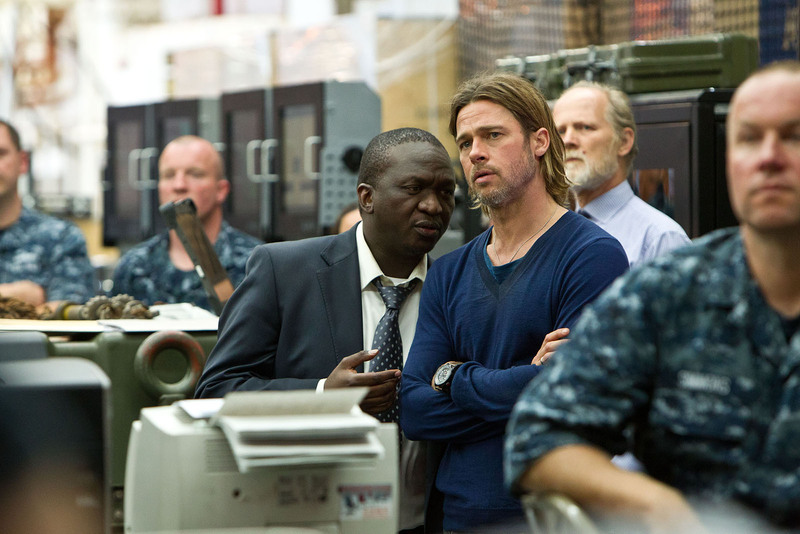 Production photo of Fana Mokoena as Thierry Umutoni with Brad Pitt as Gerry Lane in World War Z (2013). Under the sweater, Gerry wears a French blue cotton T-shirt with a crew neck that fills in the gap under the dropped neckline of his sweater. The shirt is short-sleeved, as evident by the outline of the short sleeves under the upper arms of the sweater. Pitt’s signature silver ring pendant is worn on a thin silver chain under his T-shirt. Gerry checks out the U.N.’s new command center from the RFA Argus, a British ship that portrayed the “USS Argus” in World War Z.
Gerry wears dark blue denim bootcut-style jeans with a thick brown leather belt. The tan stitched design on the bottom of the back left pocket may help identify the brand. 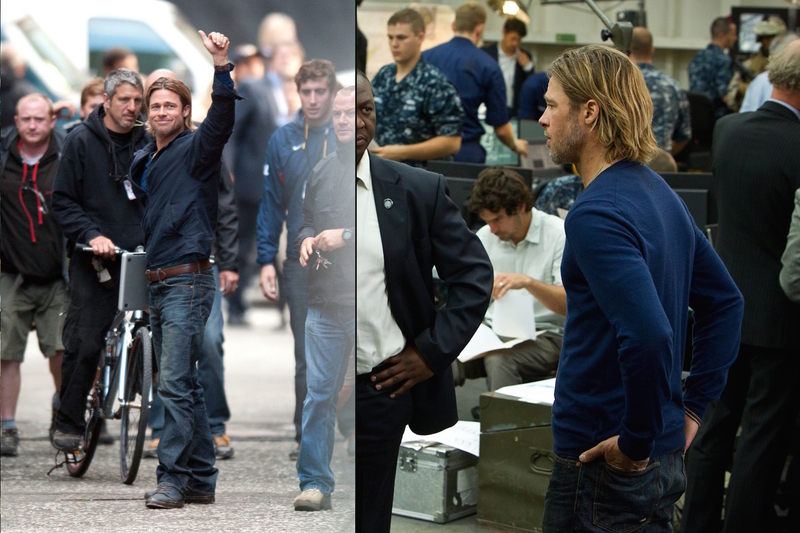 Left: Behind-the-scenes shot of Brad Pitt during production in Glasgow, which doubled for Philly on screen. Right: Promotional photo of Pitt in World War Z. Note the stitch detail on the bottom of the back pocket of his jeans. Gerry wears a pair of black leather plain-toe boots with dark brown outsoles. These low boots are laced derby-style with brown round laces through at least four pairs of metal eyelets. I know from experience how expensive it can be to replace a Volvo side mirror, so I can’t blame Gerry from stopping to pick it up (left). I also can’t blame him for slamming on the gas after realizing that zombies have taken control of Philadelphia (right). Gerry’s distinctive watch was made by the Italian brand Terra Cielo Mare, a family company inspired by Italian military history who takes its name from the Italian for “land, sea, and sky.” Part of the brand’s land-oriented (Terra) product line, the Orienteering watches take their name from the functionality that allows wearers to orient themselves using stellar maps on the back of the watch cases. Since their introduction in 2010, Orienteering watches are “dedicated to the great explorers who have always needed an instrument to orient themselves on land and sea, even in adverse conditions,” per Terra Cielo Mare’s site. The company provided seven Terra Cielo Mare Orienteering PVD watches to the production for Brad Pitt to wear on screen, as costume designer Mayes C. Rubeo explains in her interview with Designed by Hollywood. Gerry’s watch has a black PVD-treated titanium 44mm case, black dial, and 22mm-wide strap in brown English leather. Gerry wears his wedding band, which appears to be white gold, on the third finger of his left hand. It isn’t the only accessory he wears that symbolizes his connection with family. On his right wrist, Gerry wears two colorful knotted bracelets that appear to be friendship bracelets, likely made for him by his daughters. One is embroidered with teal thread while the other appears to be brown. Once Gerry sets out on his globe-trotting mission that takes him from South Korea to Israel and finally to Wales, he changes into a different dark zip-up jacket over a navy utility shirt, shemagh scarf, and baggy khaki Crye Precision G3 cargo pants. It’s the middle of a zombie apocalypse and you and your family just narrowly escaped with your lives from the violent scene of a Newark supermarket looting. If a kind stranger hands you a Budweiser, I think that’s as good a time as any to enjoy your beer. Gerry accepts a Bud from Tomas’ father. After Gerry and his family commandeer an RV to facilitate their escape from Philadelphia to Newark, Gerry’s daughter Connie digs around in the back of the RV and finds a hunting rifle, identified by IMFDB as a Remington Model 700 BDL bolt-action rifle. Gerry picks up the Remington Model 700 that Connie found in the RV before trekking into the Newark grocery store. The Remington Model 700 has been in continuous production since 1962 when the ADL and BDL models were introduced. In the nearly six decades since, countless variants have been developed in varying finishes, barrel lengths, calibers, and features. The venerable rifle is not only a popular hunting rifle for civilians, but it also inspired the M24 and M40 rifles for the U.S. Army and the U.S. Marine Corps, respectively, in addition to being adopted by various police and military forces around the world. Grocery-raiding turns deadly as Gerry is forced to defend Karin during an altercation in the frozen aisle. Given the effectiveness of a melee weapon in a skirmish with multiple fast-moving zombies, Gerry is given a kitchen knife by Tomas’ father which he duct-tapes to the barrel of the rifle as a makeshift bayonet. Brad Pitt’s Gerry Lane makes the most of monochromatic street wear, showing us how a well-traveled action hero like Matt Damon’s Jason Bourne might adapt his utilitarian aesthetic of casual jacket, layered sweaters, and jeans to a life of comfortable suburban retirement. Check out the movie . It has the personal distinction for me as the last movie I ever saw at the iconic Twin Hi-Way Drive-In theater outside of Pittsburgh, a place where my family often watched the latest releases when I was a kid. Tom Hardy’s getup as Bane from Dark Night Rises?